293 Marlborough is located on the north side of Marlborough, between Fairfield and Gloucester, with 291 Marlborough to the east and 295 Marlborough to the west. 293 Marlborough was designed and built ca. 1871 by Frederick B. Pope for speculative sale, one of eight contiguous houses (285-287-289-291-293-295-297-299 Marlborough) built at about the same time. Click here for an index to the deeds for 293 Marlborough. On August 20, 1873, 293 Marlborough was purchased from Frederick Pope by Sarah M. (Allen) Wade, the wife of Horace Stoughton Wade. Tney previously had lived at 36 West Newton. Horace S. Wade was a flour dealer and one of the principal stockholders in the Columbia Mill in Minnesota. They continued to live at 293 Marlborough in 1879, but by the 1879-1880 winter season were living elsewhere, and 293 Marlborough was the home of Rev. Leighton Parks, Rector of Emmanuel Church, and his wife, Margarita Alden (Havens) Parks. 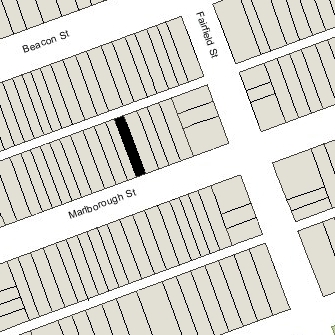 They previously had lived at 159 Beacon, and by June of 1880 had moved to 309 Marlborough, where they were enumerated in the 1880 US Census (they also were enumerated at 293 Marlborough, but the information in that census entry is incorrect and probably was given by someone else). By the 1881-1882 winter season, Horace and Sarah Wade were living at 293 Marlborough once again. They continued to live there during the next season, but moved thereafter to the Hotel Berkeley (southeast corner of Berkeley and Boylston). On April 23, 1883, 293 Marlborough was purchased from Sarah Wade by Mary Adeline F. (Smith) Kemble Winslow, the wife of dry goods merchant Edward Miller Winslow. Parker Henry Kemble, Mary Winslow’s son by her first marriage, to Edmund Kemble, lived with them. During the 1889-1890 and 1890-1891 winter seasons, the Winslows were traveling abroad, and 293 Marlborough was the home of Dr. Elliott Gray Brackett, a physician and orthopedic surgeon. He previously had lived at 44 West Cedar. He was joined by Alfred J. Rowan, a boarder, who also had lived at 44 West Cedar. By 1892, Elliott Brackett had moved to 70 St. James and Alfred Rowan had moved to Hingham. By the 1891-1892 season, the Winslows were living at 293 Marlborough once again. Parker Henry Kemble continued to live with them until his marriage in October of 1898 to Celia Campbell Humphrey, after which they moved to Philadelphia. He was a naval architect and consulting electrical engineer. Edward Winslow died in June of 1910. 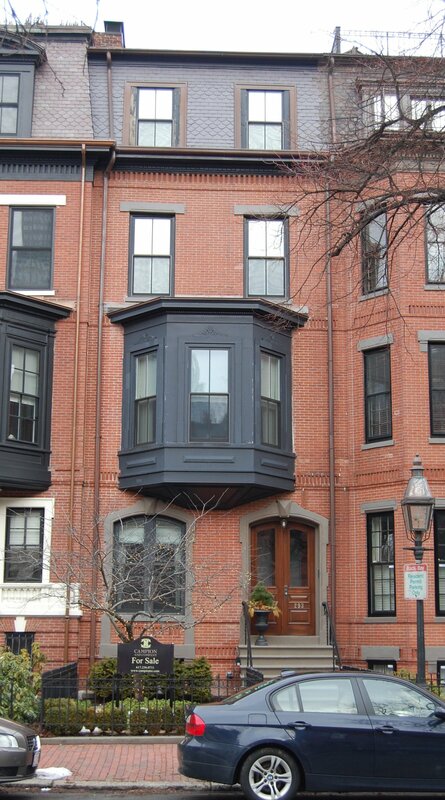 Mary Winslow continued to live at 293 Marlborough until her death in March of 1917. Her grand-daughter, Frances Winslow Kemble, lived with her during the 1915-1916 and 1916-1917 winter seasons. After Mary Winslow’s death, Parker and Celia Kemble joined their daughter at 293 Marlborough for the 1917-1918 winter season. In December of 1917, they purchased the Col. William Raymond Lee House in Marblehead, built in 1743, which became their year-round residence. By 1920, he was administrator of Massachusetts General Hospital. 293 Marlborough was not listed in the 1919 Blue Book. By the 1919-1920 winter season, 293 Marlborough was the home of Dr. Warren Richards Sisson and his wife, Emilie L. (Heffron) Sisson. He was a physician and pediatrician, and also maintained his office at 293 Marlborough. They continued to live there during the 1922-1923 season, after which they moved to Brookline and he moved his office to 270 Commonwealth. By the 1923-1924 winter season, 293 Marlborough was the home of attorney Francis Calley Gray and his wife, Helen Rotch (Bullard) Gray. They previously had lived in an apartment at 421 Marlborough. They continued to live at 293 Marlborough during the 1925-1926 season, but moved thereafter to 349 Marlborough. On September 11, 1926, 293 Marlborough was purchased from Mary Winslow’s estate by real estate dealer Leland Myron Chute and Cora R. (Joudrie) Walker Benfield, wife of mortgage broker Albert J. Benfield. Leland Chute and his wife, Agnes Marie (Pennell) Chute, lived in Brookline. 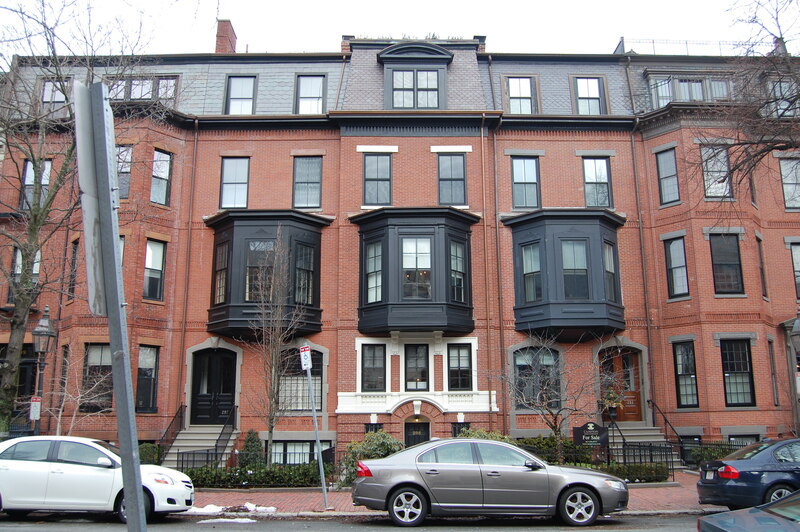 Albert and Cora Benfield lived at 1004 Boylston until about 1927, when they moved to an apartment at 31 Massachusetts Avenue. During the 1926-1927 winter season, 293 Marlborough was the home of Francis Charles Lancelot Redit (born Redhead), a salesman, and his wife, Mae G. (Farley) Redit. They previously had lived in Maryland. They had moved by the next season and were living in Cambridge by 1930. On November 1, 1927, Leland Chute sold his interest in 293 Marlborough to Cora Benfield, and she converted the property into a lodging house. By 1927, Miss Anna G. Sullivan was living at 293 Marlborough, operating the lodging house. She previously had lived in Wellesley. She continued to live at 293 Marlborough until 1933, when she moved to 345 Beacon. By 1934, 293 Marlborough was the home of Albert Benfield’s nephew, Harold Fremont Benfield (the son of Arthur E. Benfield), and his wife, Evelyn Frances (Luke) Pember Befield, who probably operated the lodging house. They previously had lived at 7 Blackwood. He was a musician (playing the xylophone) and later a salesman. They continued to live there until about 1938, when they moved to San Francisco. On May 24, 1943, 293 Marlborough was acquired from Cora Benfield by Dr. Samuel I. Epstein, a physician, and his wife, Essie Belle (Bly) MacBain Epstein. They continued to operate it as a lodging house. They lived there until about 1946. On November 26, 1946, 293 Marlborough was purchased from the Epsteins by Lois Marie (Schuster) Holton, the wife of Lloyd Dean Holton, a jeweler. Her father, Joseph Augustus Schuster, and her sister, Abbie B. Schuster, lived with them. They all previously had lived at 15 Haviland. The Holtons continued to live at 293 Marlborough until about 1952, when they moved to 198 Commonwealth as lodgers. By the early 1950s, the property appears to have been converted from a lodging house into eight apartments. On February 20, 1952, 293 Marlborough was purchased from Lois Holton by Jacques K. Micley and his wife, Dena (Broudny) Micley. On January 7, 1958, 293 Marlborough was acquired from the Micleys by Sydney Reuben Barrow, a former shoe dealer, and his wife, Josephine (Hanratty) Barrow. They lived at 291 Marlborough. On August 14, 1961, 293 Marlborough was acquired from the Barrows by Stratford William Carter, a technical illustrator and salesman. He lived at 453 Marlborough. On December 19, 1962, Edward J. McGrath, who also lived at 453 Marlborough, acquired a one-half interest in 293 Marlborough and 453 Marlborough from Stratford Carter, and on February 5, 1963, he acquired the other half interest in both properties from him. By 1965, Edward McGrath had moved to an apartment at 293 Marlborough. He was employed with Pistorino & Co., freight forwarders. The property changed hands and on November 16, 1970, was acquired by Michael (Manny) Emanuel Willdorf and his wife, Sophie (Senders) Willdorf. They lived in Malden. He was a chemical engineer who invented a process for metalizing film for windows. He was president of Madico, which marketed the product world-wide. In November of 1986, they applied for (and subsequently received) permission to legalize the property’s occupancy as eight apartments, asserting that it had been such for forty years. Sophie Willdorf died in March of 2002, and on November 21, 2006, 293 Marlborough was purchased from Michael Willdorf (by then a resident of Bradenton, Florida) by general contractors and real estate developers John P. Holland and Joseph Holland, trustees of the 293 Marlborough Street Realty Trust. They converted the property from eight apartments into a single-family dwelling. On July 24, 2008, 293 Marlborough was purchased from John and Joseph Holland by J. David Germany and his wife, Dianne C. Germany.